Gov. Rosselló signs several executive orders to boost the island's economy and recovery. Gov. 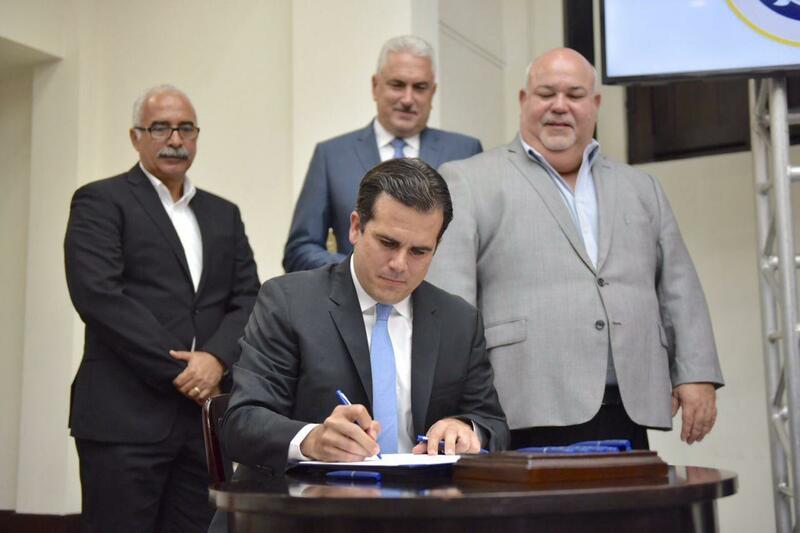 Rosselló signs several executive orders to boost the island’s economy and recovery. Puerto Rico Gov. Ricardo Rosselló signed several executive orders to boost the economy, including one that exempts small and medium enterprises from collecting Sales and Use Tax on the sale and purchase of inventory. The exemption applies to companies reporting annual sales of $1 million or less, and will be in effect from Nov. 20 to Dec. 31, as it seeks to encourage their recovery and job retention in a sector that has been hard-hit by Hurricanes Irma and María. Thousands of them have been unable to reopen across the island due to a widespread lack of electricity and access to telecommunications services. In December, the government will grant a refundable credit of 10 percent to the small- and mid-sized enterprises that fulfill their obligation of filing and paying the sales tax collected during August, September, October and November. Through the Treasury Department’s Unified Internal Revenue System (SURI, as it is known for its initials in Spanish) the government will identify businesses eligible for the exemption. They will receive a certificate that should be visible in their establishment, according to Executive Order 2017-068. Ineligible establishments must continue collecting and remitting the SUT, government officials said. Meanwhile, the order signed on Sept. 18 exempting prepared foods from the SUT will remain in place for the time being. Rosselló also signed another order to eliminate penalties for withdrawing money from retirement plans and Individual Retirement Accounts. The tax-free, penalty-free withdrawal is limited to $10,000 and is only available to residents of Puerto Rico. This order promotes homes repairs and the availability of liquidity for people to overcome the loss of income and so that those citizens who have suffered damages can deal with their situation, the governor said. That same order extends the term public employees have to use the accumulated excess of 60 days of vacation leave for up to six months after the emergency is over, to keep workers in their jobs with the assurance that they will not lose their right to take accrued vacation days. By law, public employees must use up the accumulated time over 60 days by Dec. 31, or lose it. However, after the hurricane-related emergency “many officials have not had the opportunity to exhaust those balances given the need to provide their service and avoid delays in the recovery work,” the governor’s office stated. Finally, Rosselló signed Executive Order 2017-066 designating a trustee for the Puerto Rico Electric Power Authority’s Supply and Procurement Division and any other division or office whose functions affect the public corporation’s procurement processes for goods and services. The order also delegates the appointment of the trustee to the Financial Advisory Authority and Fiscal Agency. The trustee will be responsible for overseeing and reforming PREPA’s procurement procedures of goods and services. In addition, the order establishes an administrative division within PREPA, to be known as the Office of Compliance in Procurement and Purchasing, which will be directed by the trustee. Among the trustee powers are evaluating regulations and procedures and ensuring compliance with applicable laws and regulations related to PREPA’s acquisition of goods and services. The governor’s designation of a trustee seems to clash with the Financial Oversight and Management Board for Puerto Rico’s designation of Noel Zamot as Chief Transformation Officer in charge of overseeing the work of restoring PREPA’s destroyed power grid, announced late last month. Gov. Rosselló expressed his opposition to the designation, which followed the controversy related to the $300 million no-bid contract PREPA awarded to Montana-based Whitefish Energy, which was subsequently cancelled under mounting public outcry. Hey Buddy!, I found this information for you: "Gov. gives small businesses 5-week sales tax hiatus". Here is the website link: https://newsismybusiness.com/businesses-sales-hiatus/. Thank you.